I was interviewed by Bardia Salldi, an Artomatic artist, on the subject of immigration, due to the fact that I immigrated twice. The one-hour interview was boiled down to four minutes! 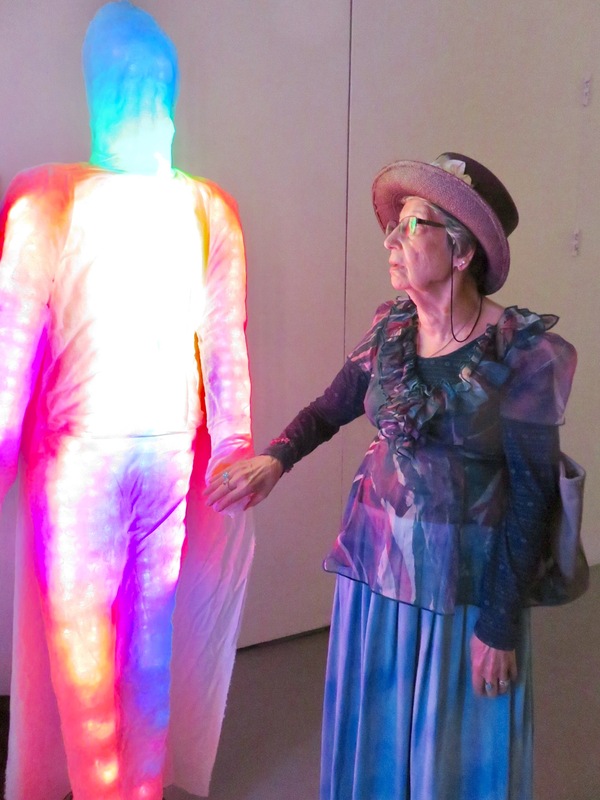 The interview was embedded in a mannequin created in the shape of a body with multi-colored LED lights within. This project was launched at the Hirshhorn Museum in Washington D.C. The Maryland Capital Park and Planning Commission in my area organized a competition to select twelve senior photographers to be featured in the 2014 calendar for Prince George’s county. The images were to represent “The Community”. 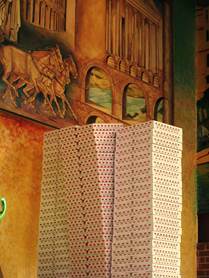 One of my three images: “The Leaning Tower of Pizza”, was selected. The image was taken at one of the several Three Brothers restaurant locations on Kenilworth Avenue. At that restaurant, the ceiling is very high and a painting of Italy graces the back wall which can be seen in the background. When employees have the time, they assemble pizza boxes and pile them up on a high counter. The towers of boxes frequently get quite high and start to lean! Therefore the title: The Leaning Tower of Pizza. The silk painting class with Diane was fantastic! I knew nothing about silk painting at all, and came away with a knowledge and understanding I didn't expect. She really knows every aspect of the art, and she's so pleasant to work with. Truly, the “First Lady of Silk Painting”! This is just a note to say thank you for your class yesterday. I enjoyed it thoroughly. I woke up this morning missing the opportunity to apply paint to silk. I wanted to watch that perfect flow of paint across the silk to see the smooth, even color with the wonderful edges. It is a very soothing media until you get to the resist blobs, of course! Thank you again for the generous sharing of knowledge yesterday. Thank you again for the enriching experience of creation using nature's gifts of color, magnificent fabric and the heart's expression of beauty. Your generous teaching and sharing of this art form exemplifies to me the nature of a true artist - one whose heart sings with a message that touches the soul and the one who selflessly opens doors enabling others to manifest their own inner beauty. Yesterday, I presented at an on campus Philanthropy competition on behalf of a student led organization called Students Helping Honduras. We were competing for students votes based on our presentations. Myself, and two others won this competition, and I believe it was largely because of the tips that you gave me on public speaking. I took very strategic pauses and made sure to slow down my pitch to make sure I was not tripping over my words. Thank you so much for all your help and I hope you are doing well! Diane, I'd like to thank you for the public speaking lessons you offered to my son before his Bar Mitzvah. I must admit that I had some doubts about how he would perform, but his speech was a complete success. He spoke clearly and really connected with the audience. Your lessons were invaluable. Besides providing very helpful tips, you also helped give him confidence. My daughter's Bat Mitzvah will be coming up soon and we will definitely be asking you to give her lessons too. You are a wonderful, no nonsense instructor and I greatly enjoyed your class at Strathmore. Rather than spending an inordinate amount of time introducing the topic, you piqued our interest and got us creating very quickly. Thanks to your organization and clear directions we were able to see for ourselves the boundless opportunities that await each of us as we combine silk with color. Diane Tuckman gave a workshop at Mo-Ed, a Jewish afterschool community, to a group of 18 kids between the ages of 5 and 12. The children who participate enjoyed themselves very much and showed great interest in the workshop. After giving each participant a silk cocoon, Diane talked about the story of silk and its’ transformations. Diane’s knowledge and ability to connect with the diverse ages and group levels made it an excellent experience for the children. Diane was extremely organized and planned out the workshop well in advance which made the class a great success. Each participant walked away with two completed painted matted silks and a silk cocoon. I am sure Diane would be a great asset to any art program for children. Thank you so much for conducting two silk painting workshops for the Cleveland Park Neighborhood Library. Twenty people attended the family workshop; fifteen people attended the adult workshop. Everyone thoroughly enjoyed learning about the silkworm and its cocoon. My kids were absolutely fascinated by the cocoons I brought them. Everyone was very enthusiastic about the class and the beautiful finished products. The banners will be proudly displayed in the library as soon as I iron them. Silk painting was a wonderful art form for a short workshop because of the almost immediate gratification. Hannah loved the class too! — Beth Meyer, Librarian, Cleveland Park Neighborhood Library.